In the "Quotes" window you can see the quotes of the used instruments only. You can edit the used instruments, by deleting or adding new ones from the Instrument Browser. In addition, you can change the order of instruments in the list of the "Quotes" window. 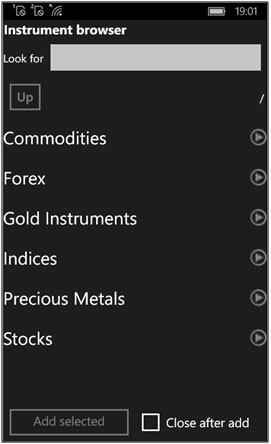 In the "Instrument in use" window you can add instruments from the Browser, delete instruments from the used list and change their location in the "Quotes" window. To delete instruments from the list of the used ones you need to mark the particular instrument and click the "Remove" button in the toolbar of the window. Moreover, you can delete only those instruments in which you have no open positions or orders (such instruments have a different font). 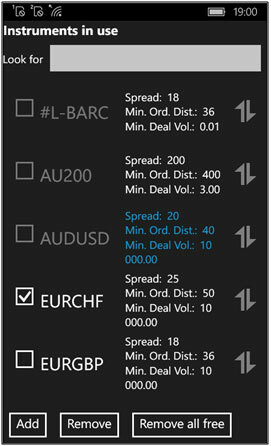 To change the order of your list (including in the "Quotes" window) you need to choose the instrument by clicking on the special right icon on the field of the instrument and move it up or down. After choosing the preferred group of instruments and getting it in the list of instruments from this group you can mark the necessary instruments and add them in the used ones. 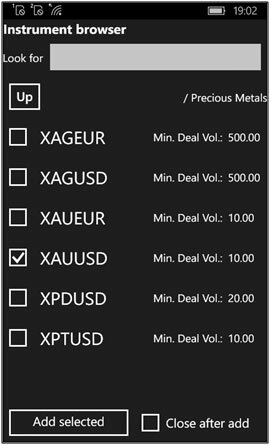 Choose those instruments that you want to add to the list of the used ones (XAUUSD, for instance) and click the "Add selected" button.